Ald. Mark Tendam (6th) attends a City Council meeting. Aldermen voted to table the long-held discussion over the future of Harley Clarke Mansion at Monday’s meeting. Aldermen voted Monday to table future discussion on the Harley Clarke Mansion until an Illinois state budget is released specifying the amount of funding cut from Evanston. City Council was split 5-4 on Ald. Ann Rainey’s (8th) move to cease discussion of the matter until the city is certain of next year’s state funding challenges. Following a proposal last week from Ald. 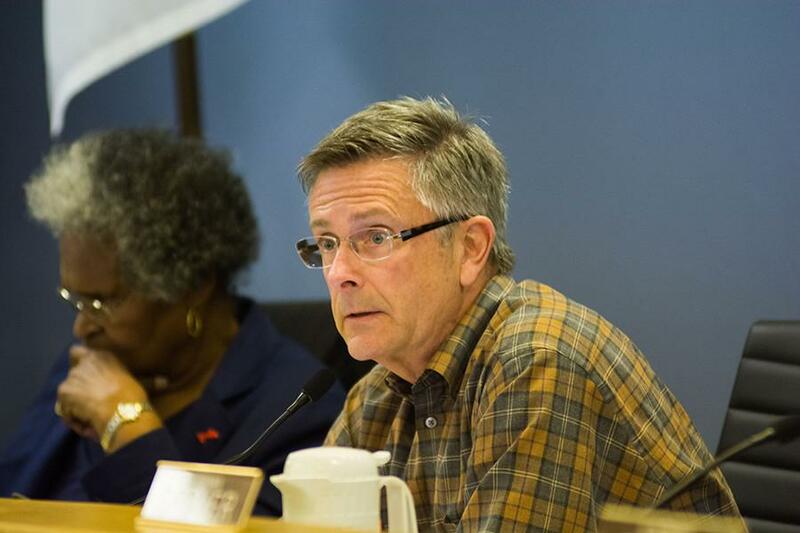 Donald Wilson (4th) for the city to fund the mansion’s renovations, Rainey said she thought discussion on proposed funding allocation for the property renovations was premature, considering the state has been stalemated over its budget for nearly four months. Wilson had proposed the city keep the mansion, located at 2603 Sheridan Road, in city ownership and allocate up to $600,000 for its renovation, establishing programming for Evanston residents. The city has sought new uses for the property since 2011 after the city and its previous tenant, the Evanston Art Center, could no longer fund its maintenance. But Rainey said the state cuts could take $1.5 million from the city’s local government distributive fund, which would impact future spending decisions. The state is also considering a statewide property tax freeze, which would affect Evanston past 2016, said city manager Wally Bobkiewicz at a special City Council meeting on Saturday morning. City staff presented to aldermen at Saturday’s meeting a proposed $56 million capital improvement plan for next year, more than half of which would be funded from debt. Evanston resident Lori Keenan, who is part of an organization trying to reclaim the mansion for public use, said it was important to consider that Harley Clarke could foster economic growth in the form of cultural tourism. “I encourage you to look at the numbers for cultural tourism as an economic engine and think about Harley Clarke as creative place-making and think about the talent we have in Evanston to do this,” Keenan said. Nearing the conclusion of the meeting, Ald. Mark Tendam (6th) recommended moving discussion of the mansion to the Parks and Recreation Board — a suggestion that quickly drew objection from some other aldermen. Wilson countered that the council’s action to not act on his own proposal, which included a recommendation to initiate discussion within the Parks and Recreation Board, rendered aldermen unable to refer the issue elsewhere. Other aldermen remained split as to whether the board should revive an issue it had just put to rest for the undeterminable future. Ald. Judy Fiske (1st) cautioned aldermen against referring the issue to the Parks and Recreation Board.